The biggest potential problem for Western economies right now – bigger than unemployment, the Middle East, the general rise in commodity and energy prices, government deficits, and the instability of the banking system – is the threat from China to Western supplies of rare earths. And our newest Merchant Banker investment offers a solution to that problem. 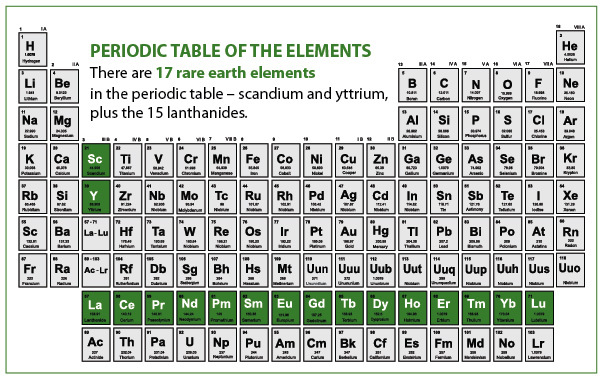 Rare earths are generally defined as the “lanthanide” elements (#57 through #71 in chemistry’s Periodic Table, pictured below), plus two additional elements that do not form part of that group: scandium (#21) and yttrium (#39). These 17 metals have found increasing use in our high-tech society – in lasers, magnets, cell phones, advanced batteries, MRI and PET scanners, high-temperature semiconductors, and numerous other products. Demand for them has increased considerably faster than global GDP. 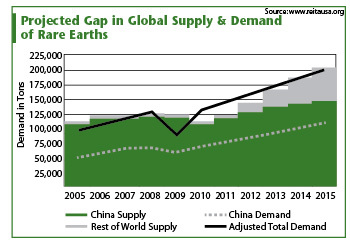 Demand in 2010 was 128,000 tonnes of rare earth oxides, compared with supply of just 115,000 tonnes, and 2014 demand is projected to hit 177,000 tonnes. Before about 10 years ago, there were several sources of rare earths, but most of them suffered from the problem that rare earth ores are generally mixed with thorium, which is radioactive. Consequently, by 2002, the environmentalists had made almost all existing manufacturers’ lives so miserable and costs so great that mines and treatment plants were closed down. That left China with 97% of the market. In retrospect, it is surprising that China took several years to catch on to the fact that it now had the Western world over a barrel. The Chinese government has reduced exports from its own mines by 35%, using their own environmental worries as an excuse. Consequently there is now a two-tier market for rare earths – with prices within China being less than half those on the international market, and world prices about 15 times their level of 2007. With demand soaring worldwide and supply restricted, there is now a race in the West to open – or reopen – rare earth mines. The U.S.-based Molycorp Inc. (NYSE:MCP), which produced rare earths until 2002 from a mine in Mountain Pass, California, is reopening its mine in late 2012. The company has been a great market success. Other potential rare earth producers are two Canadian companies – Quest Rare Minerals Ltd. (AMEX:QRM) and Avalon Rare Metals Inc. (AMEX:AVL). Both have projects in hand, but won’t be producing until 2015 or 2016 at the earliest. Then there is this week’s investment, which fed its first ore into the processing plant on May 14 and expects to open its treatment plant to produce pure rare earth oxides as soon as September. It’s the Australian Lynas Corp. (OTC:LYSCF.PK; ASX:LYC). Lynas controls the Mount Weld project in western Australia. It’s the world’s richest known deposit of rare earths, with estimated reserves of 1.42 million tonnes. The company, which has backing from the Japanese trading company Sojitz Corp. (OTC:SZHFF.PK), has completed a concentration plant at Mount Weld that began taking in ores May 14. There is just one weakness to the Mount Weld deposit; it contains primarily the lighter rare earths and is short of heavy rare earths, such as dysprosium, for which prices are even higher. Lynas is also building an advanced materials plant in Kuantan, Malaysia, which it expects to begin shipping concentrate for final processing into rare earth oxides in September. Once both facilities are fully operational, Lynas expects to produce 11,000 tonnes of rare earths annually without further expansion. At the prices of June 6, 2011, that would give it annual revenues of over $2 billion; at the average prices of the first quarter 2011, revenues would be about $1.01 billion. Nevertheless, even at the lower figure, Lynas’s current market capitalization of $3.6 billion is fully justified. In addition, Lynas recently took control of a further deposit of 107,000 tonnes of rare earths oxide in Malawi. Nevertheless, while Lynas is the only non-Chinese rare earths supplier, and even after Molycorp joins it, prices are bound to remain elevated, so the upside potential for Lynas is huge. Action to take: Buy Lynas Corp. (OTC:LYSCF.PK; ASX:LYC) at market and use a 40% stop-loss to protect your principal and your profits. It has been a rough quarter for the Merchant Banker portfolio. Both emerging market stocks and smaller-cap stocks have underperformed the blue chips. Nevertheless, our portfolio repositioning over the last few weeks has put us in a good place to benefit from the likely trends of the third quarter. One trend is turbulence in the U.S. Treasury bond market. There are two factors here. First, investor confidence in government credit risks has eroded sharply, particularly with S&P lowering Greece’s credit rating this week to CCC – a rating signifying likely imminent default. We think of the U.S. credit rating as unassailable… but the current levels of budget deficit are a record in peacetime, and six months with a Republican House have brought no significant progress in reducing those deficits. Yes, taxes will have to rise eventually, but can even the Obama administration believe that failing to get close to eliminating the deficits – or eliminating them by sharp tax increases alone – would not devastate the already feeble recovery? The second factor affecting the bond markets is the looming June 30 withdrawal of Ben Bernanke’s “quantitative easing” purchases of government bonds. Since last November, the Fed has been buying bonds for about two-thirds of the deficit. Once this stops, there may not be many other buyers out there. China is diversifying into euros and gold, while Japan won’t be buying much of anything as it rebuilds from the March earthquake. Now even the U.S. banks have said they will buy fewer Treasuries, because of the chance of a temporary default in August, which would blow up the repo market. That means that the recent strength is Treasury bond markets is almost certainly a head fake. We can expect sharply rising yields from July onward. However, inflation is returning rapidly – running at over 10% this year in import prices and producer prices, with consumer prices only months away from following. Thus Bernanke’s options may shortly be about to narrow. For the next quarter, it seems almost certain that U.S., British, and Japanese interest rates will remain very low. Even euro rates won’t rise much. But since inflation is accelerating everywhere, that strongly suggests that the boom in commodities and energy is not yet over. But the current balance of probability must be that the recent weakness in commodity and energy prices is just short-term, and that there will be at least one more major run-up before the markets finally turn around. Overall, we should remain positively oriented towards commodities and energy, while trying to avoid companies that could run into financing difficulties in a credit crunch. However, since emerging markets have performed better than wealthy ones in this run-up, it would be foolish to assume that a financing crunch would affect emerging markets first. Uncertainty for the third quarter is high. Again, we must remain nimble, and prepared to alter our orientation if new information comes in that changes our worldview. Arcelor Mittal (NYSE:MT), as its operations were being squeezed by low-cost competition. All three sales appear to have been good decisions, judging by the stocks’ performance since. Thompson Creek Metals Co. Inc. (NYSE:TC), which was hit by the general downturn in minerals stocks. This one I regret selling, but it’s too early to tell whether we were lucky or not. Corning Inc. (NYSE:GLW) yesterday hit our revised trailing stop of $18, which we had already lowered from $20. So you should sell it, making a small overall profit for Money Map VIP Trader buyers and a somewhat larger one for Merchant Banker Alert buyers. Action to take: If you haven’t already done so, sell Corning Inc. (NYSE:GLW) at market. Rockwood Holdings Inc. (NYSE:ROC) is a specialty chemicals manufacturer. It has major operations in lithium products, which are essential for advanced automotive and other batteries. Lithium operations represented 38% of Rockwood’s sales and 47% of EBITDA in 2010, so they are certainly large enough to make ROC an excellent lithium play. First-quarter earnings were spectacular at $2.24 per share, compared with 48 cents in the previous year. ROC is now up more than 140% since we bought it last year (as part of the Money Map VIP Trader service) and still looks reasonably valued with room for more growth. Corning Inc. (NYSE:GLW) is a worldwide specialty glass and ceramics producer. The majority of its sales and assets are in the Asia-Pacific region, where most of the world’s growth is likely to be concentrated in the next 12 to 24 months. Market Vectors Vietnam ETF (NYSEArca:VNM) is an exchange-traded fund that invests in a “frontier” market, where growth is rapid but opportunities to invest directly are thin. It is managed by Van Eck Advisors, a well-established fund management company with 55 years of history. With a competent manager and investment policy, VNM is thus an excellent way of participating in Vietnam’s future explosive growth. VNM currently has a net asset value of $307 million – up from $95 million when we bought it. It invests in companies with a minimum market capitalization of $100 million and average trading volume of 50,000 shares over the preceding six months; so by the standards of emerging market ETFs, it has adequate liquidity. AFP Provida SA (NYSE:PVD): By far my favorite Latin American investment right now is Chile, and my favorite Chilean investment is this pension funds administrator. PVD administers private pension funds, not only in Chile, but also in Peru, Ecuador, Mexico and the Dominican Republic, with a total of $36 billion under administration for 460,000 pension beneficiaries through 134 branches. Private pensions are a global growth sector; state pension systems worldwide are struggling with growing actuarial deficits and are finding privatization the most attractive alternative. PVD is a leader in this business in Latin America, based in its most attractive economy, and can be expected to pick up business accordingly. Orix Corp. (NYSE:IX) engages in leasing (it used to be known as Orient Leasing), corporate lending, real estate, aircraft, and shipping financing, and “investment banking” (mainly securitization, merger and acquisition advice, and venture capital). Its main client base is the Japanese small- and medium-sized business segment, which will benefit from the expected faster Japanese growth focused on the domestic economy. Outside Japan, it has a U.S. leasing business and is expanding rapidly in China. Its net income for the year to March 2011 was up 78% from the previous year. Most important, it has capital of over 16% of assets – four or five times the major international banks. Apart from making it safer, with such a large capital base, Orix will benefit substantially when interest rates rise. Aixtron AG (NasdaqGS:AIXG): Like most of the best German companies, Aixtron is technologically specialized in deposition technology for the semiconductor industry and related applications. It has a particular specialty in LED lighting applications – a very exciting growth area. The company manufactures and conducts R&D operations in Germany but sells worldwide, with 90% of its sales in the explosively growing economies of Asia. In spite of nearly $1 billion in annual sales, it has only 766 employees, a typically German level of efficiency – and the reason it can afford to continue manufacturing and researching in such a high-cost location. iShares MSCI Investable Turkey Index ETF (NYSEArca:TUR) tracks the MSCI Turkey Investable Index and has a market capitalization of $611 million. Its expense ratio is 0.61%, below the category average. Turkey’s GDP per capita is around $12,000, only one-third of the U.S. or western Europe, so it retains a major labor cost advantage over developed country competitors. At the same time, the economy is very private-sector oriented and well diversified, with major exports apparel, foodstuffs, textiles, metal manufacturers, and transport equipment, mostly to the European Union – Germany is its largest export destination. According to Forbes, Istanbul has 34 billionaires in March 2011, fourth in the world behind Moscow, New York, and London. However, Turkey’s Gini Coefficient of inequality is only 41 – below even the United States, so it does not suffer the Latin American stagnation problems that come from extreme income inequality. AdvisorShares Active Bear ETF (NYSEArca:HDGE) is the first actively managed, short-only ETF, launched by AdvisorShares in late January. Even in something as simple as revenue recognition, aggressive managements pull deals into prior quarters and play games with bookkeeping at the end of each quarter. A number of professional investors have made very good returns indeed from selling short stocks that had become overvalued, usually through “forensic accounting” examination of their financial statements. HDGE brings this sector of investing within range for the individual investor, and as such is a very welcome addition to our portfolio of opportunities. The fund’s managers have stated that they intend to put their capabilities in forensic accounting at the center of the fund’s stock selection. Sekisui House Ltd. (OTC:SKHSY.PK): Since Japan’s stock market has rebounded only about 25% from its March 2009 low – compared to 86% in the U.S. – there are buying opportunities there. And in the aftermath of an earthquake, one naturally looks to the construction and housing sectors, since they can be expected to benefit most from rebuilding of the 125,000 buildings damaged or destroyed. SKHSY is the largest Japanese homebuilder, having got into the business after its founding in 1960 through manufacture of factory-built modular homes. More recently it has expanded into apartments and established a broad range of housing-related activities, such as DIY stores. Its real advantage in this situation is its capability in factory construction and its focus on the middle market, which is where the majority of reconstruction demand will arise. GlobalX Colombia FTSE 20 ETF (NYSEArca:GXG): Colombia is a particularly interesting emerging market. It has a relatively small government and low foreign debt. Although it is relatively poor, with purchasing power parity GDP per capita of around $9,000, it is hugely endowed with natural resources: its oil production is currently increasing about 20% per annum. One extra upside – because of the civil war it has suffered over the last 50 years, Colombia has remarkably little infrastructure. There is, for example, no railroad cross the Isthmus of Panama, nor is there a modern coastal highway along the north coast. Colombia’s infrastructure problem is now being solved, largely thanks to a number of Chinese projects – there is an obvious trade-off between China’s need for resources and Colombia’s need for infrastructure. Pan American Silver Corp. (NasdaqGS:PAAS): Silver prices have had an incredible run in the last year, followed by a sharp drop since late April. However the run-up this year has not yet been reflected in the earnings reports of mining companies. PAAS’s first-quarter earnings of 60 cents/share, for example, related to a quarter when silver prices averaged $33 per share compared to the current $37. Operating costs rise a little as prices rise, but the potential for margin increases is huge. Trina Solar Ltd. (NYSE:TSL): Of the highly subsidized “new energy” alternatives, solar power is by far the most promising. It has a decided advantage over wind power: advanced research is improving the efficiency of solar cells, making the economics improve steadily. That’s why Spain nearly bankrupted itself by solar power subsidies and Italy has just reduced them sharply. The profitability of solar power generation with a given level of subsidy steadily increases, making it very attractive indeed if subsidies were set a few years ago. It seems likely that within the next 10 years, solar power will become truly attractive on an unsubsidized basis, in which event usage of solar panels is likely to enjoy an explosive expansion. TSL is a fully integrated manufacturer of photovoltaic modules, is among the market leaders, and has cost advantages over much of its competition. It is close in scale to the leading U.S. producer First Solar Inc. (NasdaqGS:FSLR) but sells on one-third the P/E ratio. Finally, we have one holding in S&P 500 put options, in the 600 strike price options of December 2012 (CBOE:SPX1222X600-E). We have an order in to buy another, the December 2013 700 strike price options (CBOE:SPX1321X700-E). The purpose of both is to protect our overall portfolio against a big market drop, like that of 2008 to 2009. It’s an insurance policy. It doesn’t pay out if the market is strong, but in that case, our other investments should do well. However at a cost of 2.5% per annum of the portfolio value, we have gained the right by selling the puts to receive a substantial chunk of investable cash at or near the market bottom, just when opportunities are most attractive. We also have a small holding (again, 2.5% of our portfolio) January 2013 put options with a strike price of $75 on the Barclays 20-year Bond Index ETF (CBOE:TLT1319M75-E). These have performed poorly as Treasury bond yields have declined in the last few weeks. Yet I expect them to rise sharply once the ongoing rise in inflation and the June 30 end of Ben Bernanke’s “quantitative easing” manifests itself in the bond market. 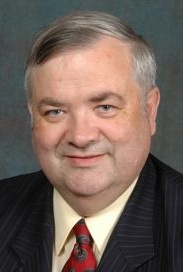 an advisory panelist for The Money Map Report and a contributing editor to Money Morning. He is a former investment banker with 25 years' experience in London and New York. He is also the U.S. Treasury advisor to Croatia.